The Hope Headset is a great addition to your bike, offering the best of both worlds - strong for downhill and light for cross country. A range of 4 headsets is now available. All use common parts (bearings, taper rings, crown race, taper ring cover) with just the cup or seat changing dependant on type of fitting. 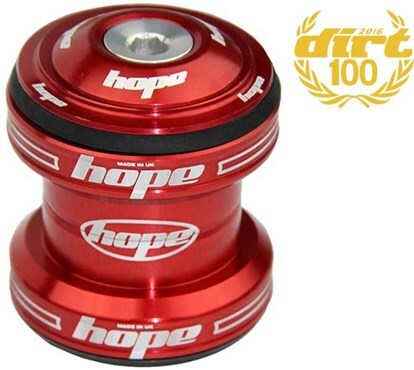 To run alongside the conventional 1 1/8 inch threadless headset, this year also sees an integrated (no cups, seats to fit inside the frame) an integral (low stack cups) and a 1.5 inch - 1 1/8 inch step down. The bearings themselves are STAINLESS STEEL and are replaceable. The cups, taper ring and crown race (which is now split for easy installation and removal) are all machined aluminium. All headsets come complete with the Hed Doctor, and the 1.5 step down with a stainless steel bolt version. Sealing is achieved through an adjustable taper ring cover and integrated rubber seal. The bearings also incorporate their own sealing, and being made from stainless steel resist corrosion and its by products much better than a conventional steel bearing. The conventional 1 1/8 inch headset is available in the 6 standard colours - red, blue, silver, black, gold and gunsmoke, whilst the other 3 models are available in black only. The 1.5 inch stepdown has a revised lower cup assembly which drops the crown of the fork down by 10mm, improving clearance between forks and down tubes. An aftermarket crown race is also available which has 3mm of extra height built into it, which again can be used to help with clearance issues. Overall the quality of the product is brilliant but is let down by the price which is quite expensive.. Prompted to buy by the reduced price plus an online voucher. Very slight delay in supplying my colour but was kept well informed by email which is important.Hope products arent cheap but perform very well & at this price its a nobrainer!